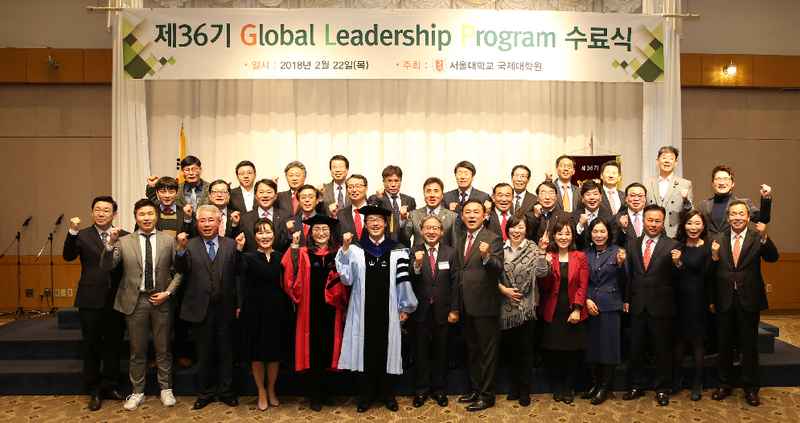 The 36th Seoul National University Global Leadership Program (hereafter "GLP") concluded with a graduation ceremony on February 22nd, 2018. The 36th GLP cohort was composed of 37 professionals from diverse backgrounds. The professionals were composed of corporate managers from diverse industries, conglomerates such as Samsung, Lotte, Hanhwa, and public enterprises including Korea Electric Power Corporation, Korea International Trade Association, Furla Korea and more. The 36th GLP members attended a total of 21 lectures, .given over a period of six months were composed of practical academic courses, international area studies courses, and cultural understanding courses to provide a multidimensional perspective on the modern business environment. For more information please visit www.glpceo.org.